We have wrapped time on our wrist. It makes us punctual. In the same way, if we can wrap all precision features before a golf game, it will give us some sure winning shots. Garmin Approach S6 is a feature packed golf GPS for such winning moments. You just have to warp one on your wrist. Now all the twist and turn will mesmerize your opponents. You will found a changed attitude when you have one of these devices on your Golf Bag. No matter how complicated the course is or how challenging the weather is, you will always have the upper hand. Let us see what features make this golf GPS so unique. What are the unique features of Garmin Approach S6 Golf Watch? The Garmin Approach S6 is the slimmest and lightest GPS watch of its kind. Its updated GPS technology makes it a necessary item for any golfer. If you want to be an expert in swing, go and get it. This Garmin Golf watch is loaded with Swing Metrics. The metrics include Swing Tempo and Tempo Training. The Swing Tempo measures your up and downswing. It comes up with a swing ratio for you. Based on the expert golfer, the ideal ratio is 3:1. The Tempo Training helps to synchronize your ratio with the 3:1 standard. This Garmin Golf GPS watch comes with more than 41,000 preloaded golf courses map. The fast processor helps you to get into your second shot view. Moreover, a dedicated Courseview button controls this feature. The high-resolution touchscreen is colorful. It gives you the yardage to the front, back, and middle of the greens. It is not a problem anymore if you cannot see the pin. The PinPointer blind shot assistance will tell you the pin position with a directional arrow. Each time you move the pin, the golf watch will give you precise distance. The S6 Garmin Golf watch is fit for any environments. It is rugged and survives under 50-meters of water. Therefore, sweat or rain, nothing can beat it. Additionally, you can see and print your digital scorecard for review. 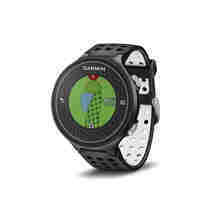 This Garmin Golf watch works as the extension of your mobile device. You can connect your mobile device through Bluetooth and get notifications from your cell phone. Moreover, you can read emails and text from the smart wristwatch. No matter you have an Android or iOS device, you will always are on the go with Garmin Approach S6. How can you update your Approach S6? The upgrade process is similar to the updating of your smartphone. To get the latest software and amp update, you need an account in Garmin Connect. Now connect your S6 through a computer and get all the upgrades through Garmin Connect. This upgrade will ensure new app features, course maps. Additionally, you will get all the detail features of the courses. Some metrics need constant updates. Therefore, the more frequent your updates, the more polished your shots will be. How do you reset your Approach S6? You can reset the S6 in two ways. The first way is a soft reset. You have to hold the Light/Power button for 30-seconds. After releasing the button, your device will reset for new performances again. If the device is still not working up to the par, go for a master reset. Turn the machine off. Now press and hold the Score button then press Power button. Release all of these buttons after you see the message "Clear user data?" Select yes, and you will get a refreshed device. How can you calibrate the compass of Garmin S6? The compass is calibrated from the factory. However, it is common to see some unusual compass behavior. Each time you see a confused compass, make sure you calibrate it. Just like your mind, the extreme temperature can perplex your watch sometimes. It will not be a good idea to calibrate while you are standing near golf carts, car, or powerlines. For manual calibration, go to the hole information screen and select the three parallel icon. You will get further instruction for calibration. What are the differences between Garmin Approach S6 vs. S60? Garmin Approach S6 is a classic Golf GPS watch. However, Garmin Approach S60 is a lifestyle watch with activity tracking and fitness monitors. Therefore, S6 will not give you the benefits of activity tracking and smartwatch. Garmin S6 has a 1” screen whereas S60 comes with a 1.2” screen. Both have the touchscreen and are sunlight visible. The display size and limited features affect the battery life of the device. You can use both of the Garmin golf watches for 10 hours in GPS mode. Nevertheless, S6 has 20 weeks of battery life in watch mode, whereas S60 has 10 days of battery life as a smartwatch. Garmin S60 Golf Watch has 1 GB memory whereas S6 comes with only 512 MB memory. Therefore, you may have to selective while saving the course information. The storage is enough for a basic golf watch like S6. Garmin Approach S60 has AutoShot features that measure the short distances. You will miss this feature in S6. Hence, you have to rely on your experience while using S6. Moreover, the AutoRecord function records the game and provide post round analysis. After every game, you can dissect all the performances for the next winning shots. Nevertheless, Garmin Approach S6 does not have these features. You can calculate distance in the course even with up and downhill. However, you will need an S60, which has PlaysLike distance feature. It will give you precise distance measurements. Approach and attitude are essential for any challenge. In Golf, you can have both when you have a Garmin Approach S6 gps golf watch on your wrist. This compact but highly efficient GPS watch ensures a perfect precision for your par. This exemplary but useful device will provide you all the facilities for winning shots in an affordable price tag. Do you still want to wait to get one of it? I do not think so. Therefore, put a Garmin Approach S6 before packing your Golf Bag.